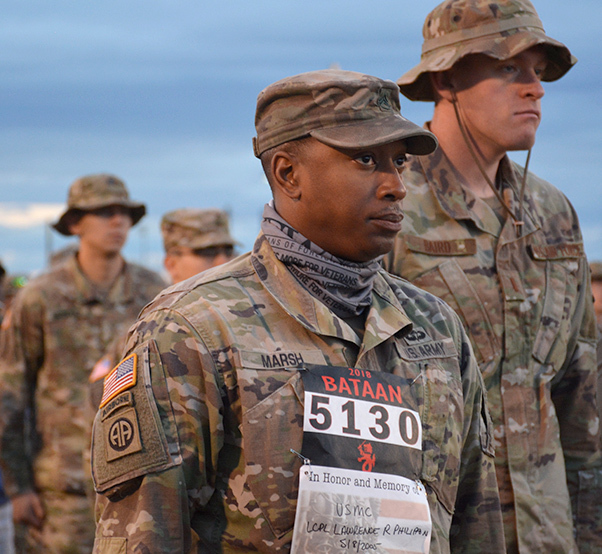 More than 8,400 marchers participated in the 29th annual Bataan Memorial Death March at White Sands Missile Range, N.M., March 25, commemorating 76 years of the Bataan Death March. “Everybody has their own motivation for why they are here to do this journey today,” said White Sands Missile Range Commander Brig. Gen. Eric Sanchez at the start of the event. U.S. Air Force retired Chief Master Sgt. Paul Kerchum, a World War II Bataan Death March survivor, greets participants of the memorial march before step-off March 25, 2018, at White Sands Missile Range, N.M. Seven World War II Bataan Death March survivors attended the event in support of the memorial participants. The 26.2-mile Bataan Memorial Death March is set on the hilly, desert terrain, with sometimes unpredictable weather. Marchers compete in teams or individually. Some compete in the “heavy” division, carrying 35-pound rucksacks. WSMR Garrison Commander Col. Dave Brown reminded participants that this is more than a marathon. “Why are you here? What motivates you?” he asked. 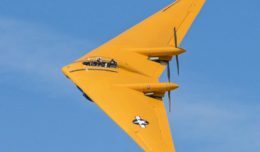 “When I put words to paper about what this (event) means, I think it is to properly honor the fallen, show due respect to the survivors and facilitate the rehabilitation of our wounded warriors,” Brown said. “But more importantly each one of you is out here to challenge yourselves today by marching or running in honor of somebody or something that is important to you. You being here is important because it helps us remember the past and you are helping us tell the Army story each and every year. 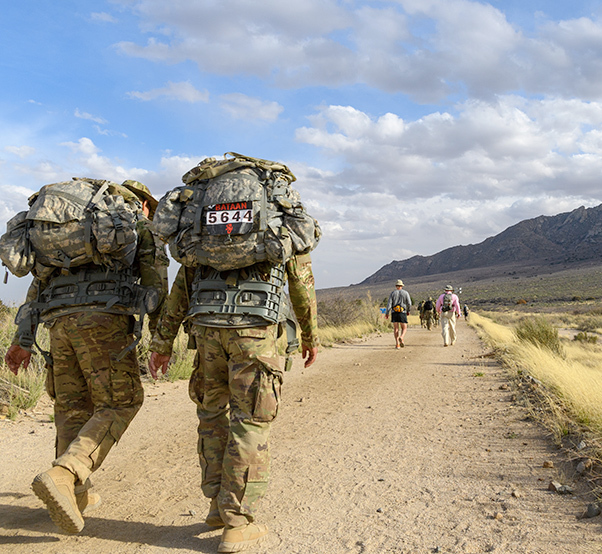 Indiana National Guard soldiers compete in the Bataan Memorial Death March at the White Sands Missile Range, New Mexico, March 25, 2018. As participants reached the finish line, they had the honor of being congratulated by survivors of the Bataan Death March. 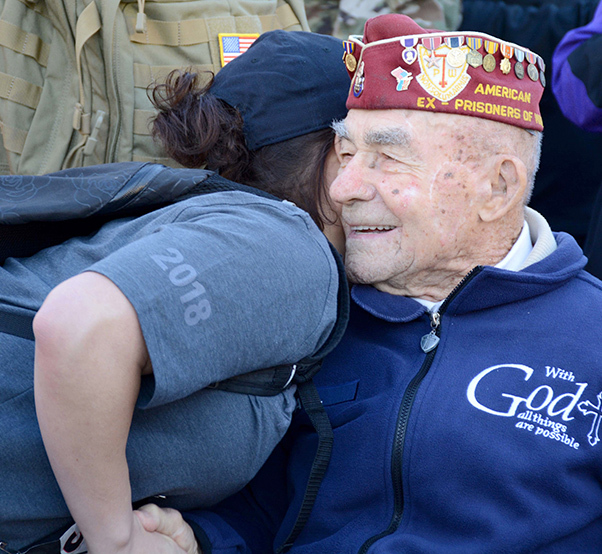 Maj. Trisha Stavinoh was one of those who crossed the finish line early in the day and was greeted by Bataan Death March survivor Oscar Leonard. “It makes me so happy to see him because he is such an inspiration,” said Stavinoh, a sports dietician at Joint Base San Antonio. First Lt. Rebekah Mazany, a Marine Air Defense Control Officer from Marine Corps Air Station Cherry Point, N.C., attended a standing-room only event to hear Leonard speak the day prior. 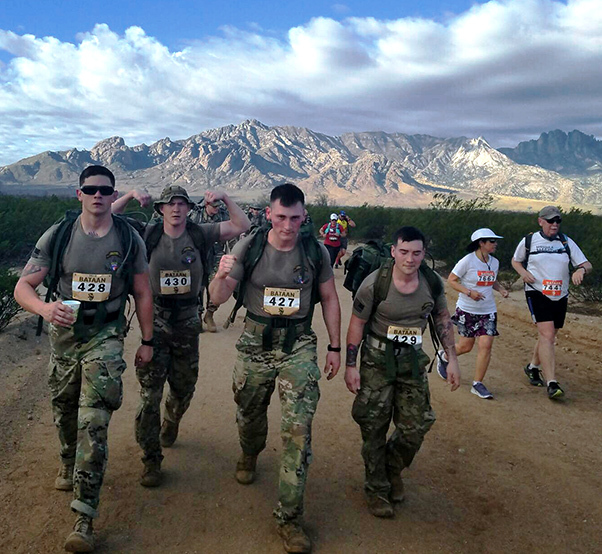 Service members, families and civilians participate in the 29th Annual Bataan Memorial Death March on March 25, 2018, at White Sands Missile Range, N.M. The Bataan Memorial Death March is a 26.2-mile run/ruck/walk event held annually to honor thousands of American and Filipino soldiers who defended the Philippines at the outbreak of World War II, particularly the 75,000 who surrendered to invading Japanese forces on April 9, 1942, and were marched by their captors over 60 miles through treacherous jungle terrain and into captivity. “I was thinking about what he talked about yesterday, learning that he spent 42 months as a prisoner of war,” said Mazany, who was in full uniform to run the 26.2-mile march in combat boots. She ran her first Bataan Memorial Death March in 2008 while still in college. Since then, she has walked it once and ran the course on four other occasions. “You don’t get this opportunity anywhere. It’s living history and a fleeting opportunity,” she said. The United States Air Force honored the survivors with a demonstration of American air power with a flyover of two F-16 Fighting Falcon jets from the 311th Fighter Squadron of the 54th Fighter Group based at Holloman Air Force Base, Alamogordo, N.M.
A Soldier participating in the Bataan Memorial Death March gets ready to start the march, March 25, 2018, at White Sands Missile Range, N.M.